This month I have managed to participate in a food blogging event , Taste and Create. It is my very first time to do so and I am very excited. And, I’m honored to be partnered with Grace of A Southern Grace. She’s a prolific blogger and her site is a veritable source of good recipes. It didn’t take me long to decide which of her recipes I should do.. I’m a sucker for sweets and her Bewitching Black Bottom Cupcakes cast its spell on me. Not to mention the fact that she attested to this recipe as something that’s been tried, tested and true. I really hoped that I’d do justice to this recipe. But leave it up to me to mess up an established recipe, lol! I ended up baking the cupcakes two times — for good reason. I was watching American Idol while baking… bad idea! When the cupcakes came out of the oven, I thought it didn’t look anywhere like Grace’s. Why???!!!! I followed the recipe, or so I thought. They were very fudgy and obviously, they haven’t risen at all… and then it hit me.. I forgot the baking soda! Duh! But hey, they may not look like a million, but they sure tasted good. I used German Black Forest Truffle chocolate and the flavor came out really well. 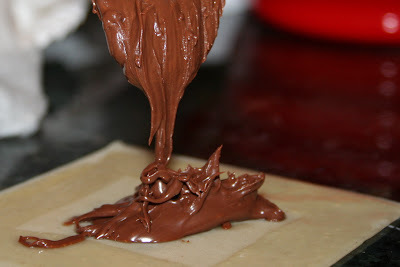 So the next day, I decided I will bake again, but this time, I thought of using Scharfen Berger organic dark chocolate. Unfortunately, there were things in the recipe that I had to change up because I was left with no choice. First, I used the 1/3-less fat cream cheese because this was what I had left in the fridge. I honestly thought I still had a bar of the regular cream cheese, but found out I had none. Second, I didn’t have enough of the regular cocoa powder left (which I thought was plenty). 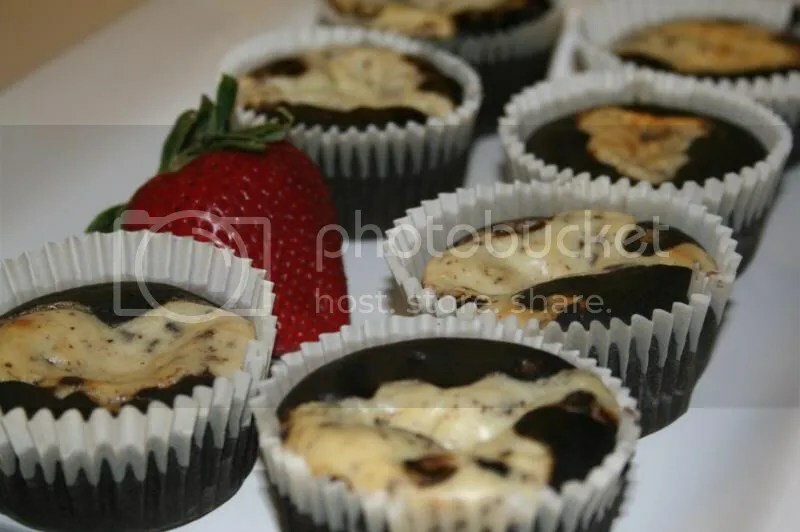 The only thing I have available in my cupboard was the dark dutch processed cocoa powder and so I added 2 tbsps of that out of the 5 tbsp that’s called for in the recipe. 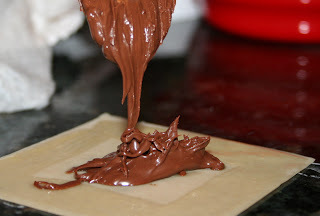 And thirdly – this was totally my choice – I used cake flour instead of the all purpose flour. 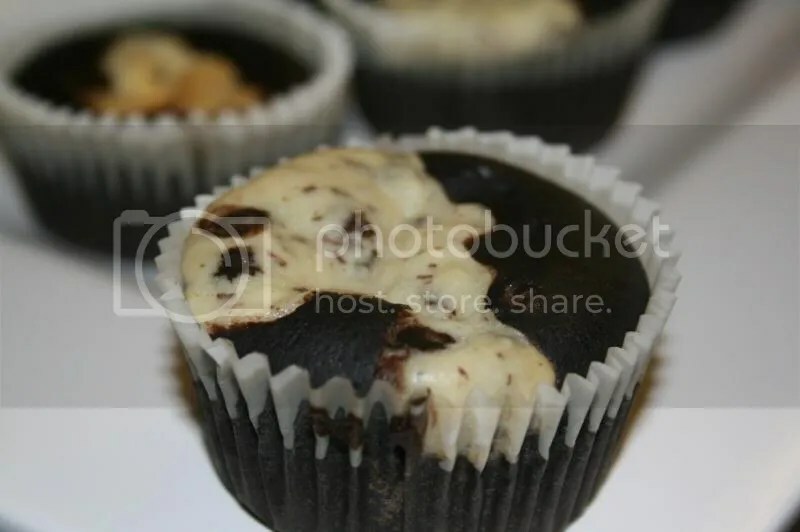 I wanted the cupcakes to be more cakey and I thought cake flour just might do it. I felt like I was experimenting with the recipe. 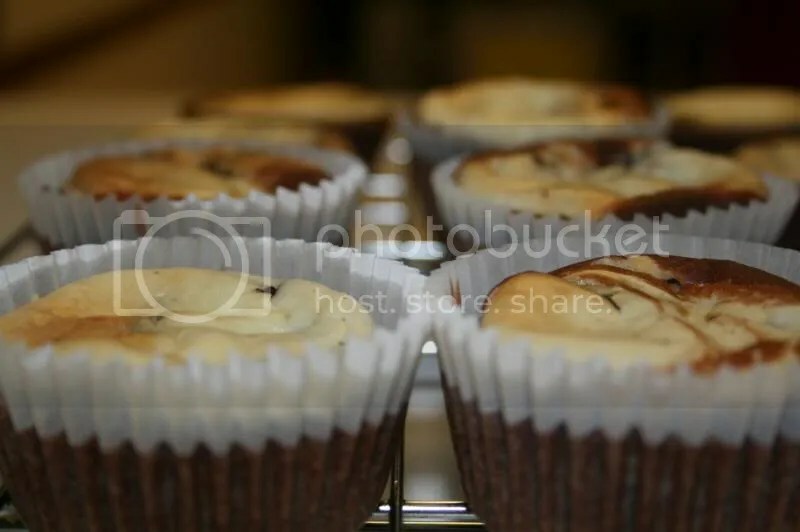 I had my fingers crossed the entire baking time, hoping that the cupcakes would come out ok, or at least better than the first batch…. and.. tadaaaahhhh…. They’re still not as pretty as Grace’s but it certainly looks much better than the first batch I baked. They’ve risen a bit, but I don’t know why they’ve sunk in the middle. 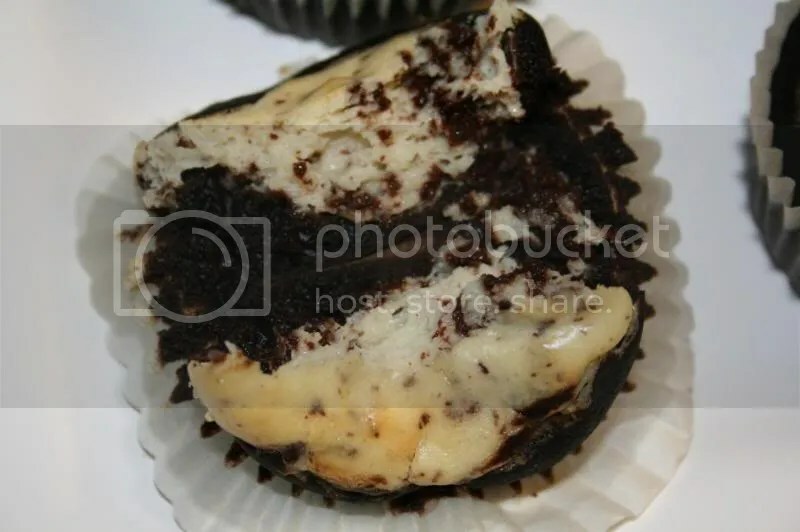 But all that aside, the cupcake looks truly bewitching.. mouthwatering… They’re definitely cakier but not as sweet as the first batch I made because of the double dose of dark chocolate in it. It’s perfect for coffee or maybe a little bit of vanilla icecream on the side? And that, my friends, is my very first experience of Taste and Create. Thank you Grace for a beautiful recipe. I learned a valuable lesson – TIVO American Idol when baking!!!! I have yet to meet a person who doesn’t like Nutella. And if I do, I would certainly tell that person that he/she is not normal! What’s not to love about it? This gooey, rich hazelnut chocolate spread is just addicting. If you’ve read my previous posts, you’d know that we’ve got friends who are leaving for South Africa, the Logans. Our other friends, Marcy and Heredes, made dinner for them on Monday night. Marcy made a very tasty lasagana and salad (wish I had photos of her lasagna, sorry). And she requested me to make this for dessert. How could I say NO? 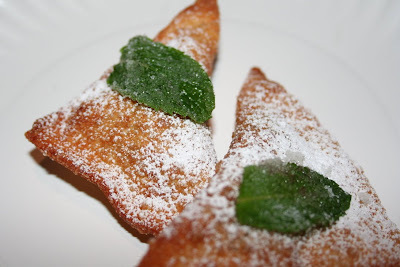 And so we had this chocolate-filled wontons for dessert, a perfect Asian-Italian fusion. Thanks again to my my fave Chef, Giada de Laurentiis for the recipe. I’m telling you, if you’ve got a chocolate craving and you just don’t want to eat Nutella out from the container, this would be a good substitute. Very easy, very simple. The crunchy wontons with the creamy chocolate just hits the spot! The only thing is that when frying, this requires your full attention as the wontons get done ever so quickly! The sugared mint leaves above is just a garnish (as suggested in the recipe), but the wontons are perfectly fine eaten without the herb. Enjoy! P.S. Photos courtesy of Holly. Great job, Holly!